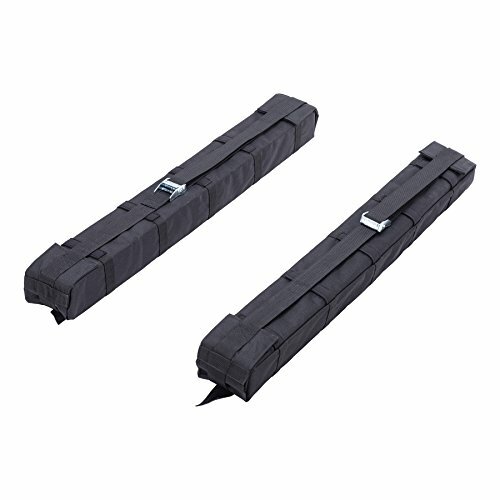 Made of ultra-soft material, our roof rack causes no scratching or scuffing to your car. With adjustable and heavy duty straps, our products can meet most of your sporting or tool needs. Ultra-long straps & aircraft buckles can definitely secure luggage over 165.3lbs, which decorates your journey with easy storage! Besides, our product has a universal car fitment, which ensures its versatility. With so many amazing features, come on and get one now! Rack Dimension: 33.5" x 3.1" x 4.1"
Soft Rack Straps Dimension: 1.5" x 90.6"